Rachel Von | The Journal Gazette Carroll's David Ejah, right, goes in for a shot past Warsaw's Jack Rhoades during the first quarter at Carroll on Friday. Rachel Von | The Journal Gazette Carroll's Richie Gross jumps up to shoot the ball over Warsaw's Tyler Metzinger, far left, and teammate Jaylen Reese during the second quarter at Carroll on Friday. Carroll claimed a regular-season clash of conference champions at the Carroll Fieldhouse as the SAC-winning Chargers defeated NLC co-champion Warsaw 46-32 on Friday. Carroll (18-3) nearly led wire-to-wire, trailing for just 24 seconds when the Tigers (11-11) took a 5-3 advantage. While Carroll was held 13 points below its season offensive average, Beasley expected nothing less from Warsaw. 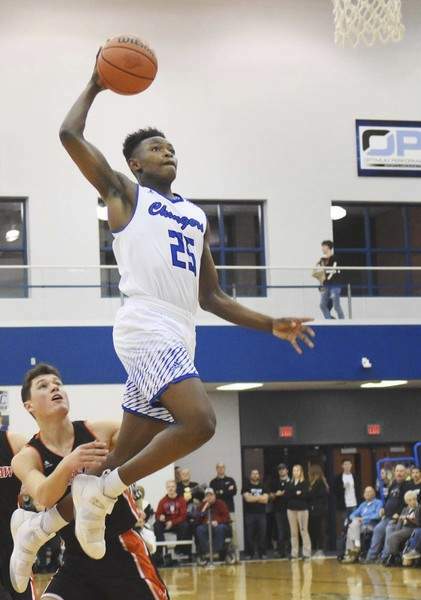 With several prolific offenses potentially looming in next week’s East Noble Sectional, including the host Knights as well as SAC foes North Side, Snider and Northrop, the Chargers’ opening-round opponent, Carroll’s ability to play both a high- and low-possession game will prove crucial. “Sometimes in a game, you have to play both of them,” Beasley said. “We can grind it out, and we have the athletes that can run, but Warsaw’s not going to let you run. Conversely, Ogle likes the challenge of wrapping up the regular season with a foe the likes of Carroll. “Carroll has a good atmosphere here, and we enjoy coming here,” Ogle said. “The level of opponent, the quality of play that Carroll brings is going to be good for us as we head into sectional play,” Ogle said. Carroll used back-to-back Arius Jones baskets, the first coming on a breakaway dunk, to extend its lead to 30-20 with 3:59 left in the third quarter. 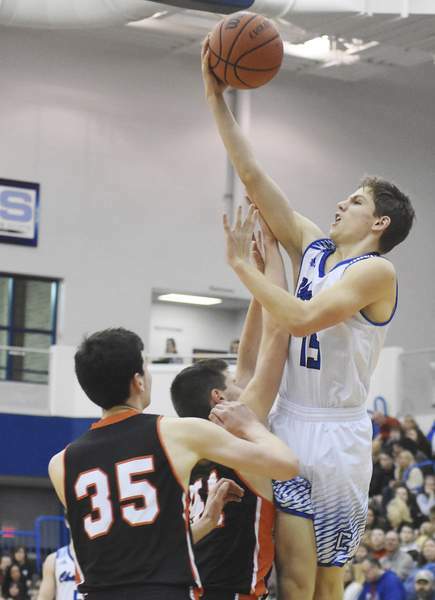 Warsaw would draw no closer than seven the rest of the way, as the Charger defense proved stifling to the point of frustration at even finding open space, let alone open shots. The Tigers were limited to just five second-half field goals. The Chargers ended the first quarter on a 9-2 run, ultimately extending their advantage to 18-9 with 4:47 left before halftime courtesy of a David Ejah putback. Ejah led the Chargers with a game-high 14 points, nine coming in the first half. But the Tigers would respond, using 3's from Zach Riley and Jack Rhoades as part of an 8-0 run to close back within 18-17 at the 2:46 mark of the second. “In the first half, we weren’t very aware defensively, but in the second half we got better,” Carroll coach Marty Beasley said. Notes: Prior to the varsity game, members of the 1968 graduating classes of Arcola and Huntertown high schools – the last classes to receive diplomas from the respective schools before consolidating into Carroll – were honored. … The Charger girls cross country team received rings recognizing their second-place finish at the state finals in October. … Carroll improved to 5-2 in its last seven matchups against Warsaw.